The Old Mill forms part of East Newtown, a farmstead situated on a branch of the Routing Burn above the southern banks of the Coquet. The earliest part of this handsome group of buildings dates from the early to mid 18th century. 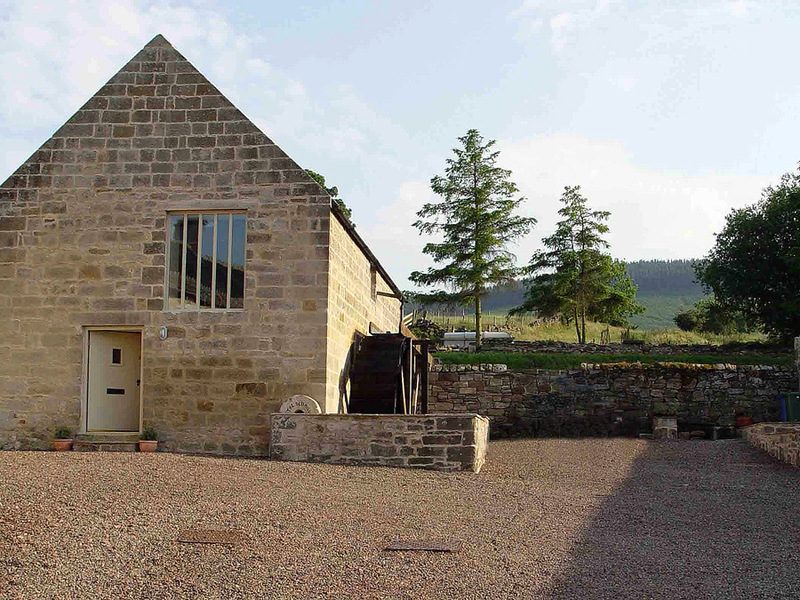 Arranged around a courtyard, the farmstead consisted of a farmhouse, accommodation for farm labourers, barns, stables, cart sheds, byres, a pig sty and, of course, the mill. Contrary to what its name implies, settlement and farming at Newtown began long ago - an agricultural settlement or ‘township’ is first recorded here in 1249. You can still see the earthworks, banks and hollows of this thriving medieval settlement in the field above East Newtown, from the public right of way. The township included a ‘bastle’, a type of fortified farmhouse typical to this area and whose stone was probably used to build East Newtown. The remains of a larger-scale fortified dwelling – known as a ‘pele-tower’ - can be see in the neighbouring township of Great Tosson, a ten minute walk (uphill!) from the Old Mill. Harnessing the power of water has a long history here too. A building in a similar position to the Old Mill is first recorded on a map drawn by Edward Smith, a surveyor from Rothbury, on the 27th March 1824. This map shows a large pond adjacent to the building but it is currently unknown whether this building was a mill. The Old Mill appears to have been built in the mid-19th century, perhaps as part of the improvement and enlargement of the farmstead following its sale to the Duke of Northumberland. A farm mill, the building probably contained a couple of millstones, a thresher and other machinery. The mill fell out of use in the mid-20th century. 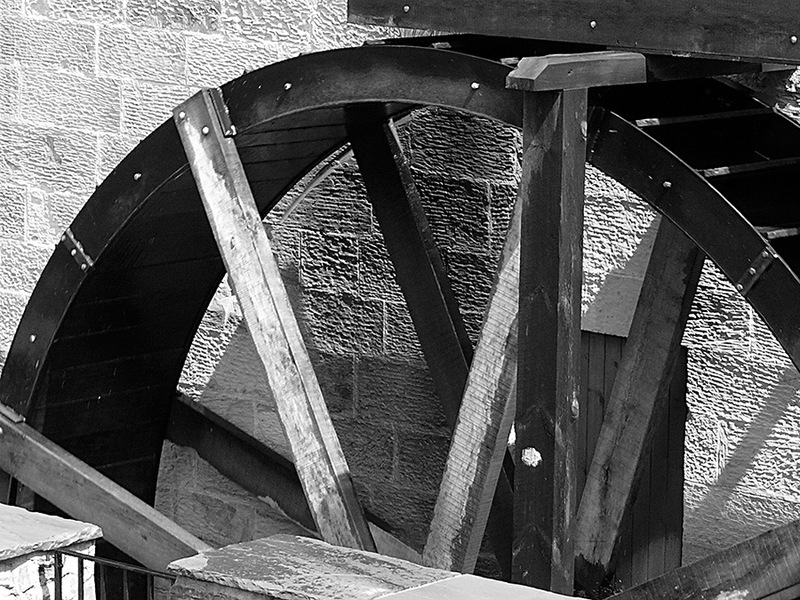 The internal machinery was removed, and the building altered to suit the needs of the farmer, though the wooden launder that fed the mill wheel and the bottom-half of the wheel itself remained in position. You can still see a pair of millstones and some of the machinery from the Old Mill leaning up against the wall at the top of the yard. 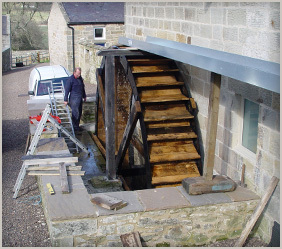 In 2003 planning permission was granted for the renovation of the Old Mill into holiday accommodation, with the requirement to reinstate the mill wheel. 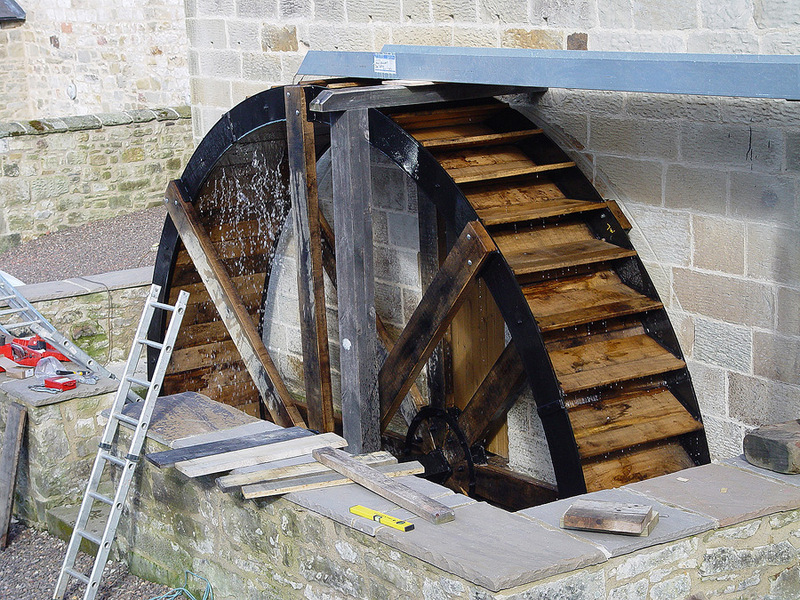 A new wheel and launder was fitted in March 2006. Alarmingly the wheel buckets leaked at first but within a few weeks the wood had swelled and the buckets were watertight. 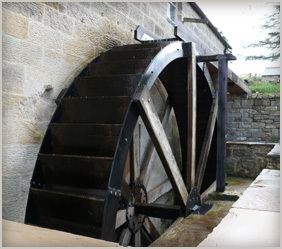 The mill wheel turned continuously until recently, when the wheel ‘jumped’ out of kilter because of a crack inside the wheel hub. 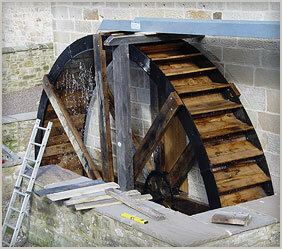 Happily the Mill wheel has now been repaired as can be seen in the video. Sources: The Heritage List for England; Keys to the Past (Northumberland Historic Environment Record); Northumbrian National Park’s Historic Village Atlas (Great Tosson section); Northumberland Communities (Rothbury section); Field report by Duncan Hutt, North East Mills Group.